I believe right there the trees stop and laugh at us. Whether it is planted in the inner city or deep in the countryside, as long as it has soil, water and sunshine it will grow. The tree doesn’t look for excuses for why it can’t do what it was purposed to do. It just does it. It grows and bears fruit. We have to learn to be abundant where we are planted. Take inventory of where you are right now. What is there that can be done by you? What gap can you fill? What soul can you reach out to? What aspect of ministry can you lend your talents to? Don’t always look at the big stuff; there are little tidbits of things that can be done by each of us. There are small ways to minister (serve) that God can put to good use to cause increase in His kingdom. Psalm 1:1-2 speaks of the choice of the individual to do right. “Blessed is the man that walketh not in the counsel of the ungodly, nor standeth in the way of sinners, nor sitteth in the seat of the scornful. But his delight is in the law of the Lord; and in His law doth he meditate day and night,” (KJV). Now it’s time to walk in the fruitfulness of vs.3, “And he shall be like a tree planted by the rivers of water, that bringeth forth his fruit in his season; his leaf also shall not wither; and whatsoever he doeth shall prosper,” (KJV). So, if you have already made the same choice and are now planted, it’s time to let some fruit grow. Nobody will know anything about you unless you start growing fruit; until you start producing something. An apple tree is not an apple tree if it does not produce apples. Matthew 12:33 declares, “. . . for the tree is known by his fruit,” (KJV). Today, I urge you to make a proclamation to yourself and say, “Self, today, right where I am planted, I will produce!” Do you not know that God will honor that? The Word of God emphatically says, “If ye have faith as a grain of mustard seed,” (Matthew 17:20, KJV). God doesn’t need you to try to grab hold of the biggest thing in ministry there is. But, if your heart is sincere and your faith is genuine, He will honor the fruitfulness of every little step you take. Don’t let intimidation stop you from being effective for the Kingdom of God. If all I have is a small measure to work with then, I’m going to work that small measure until I see the increase. 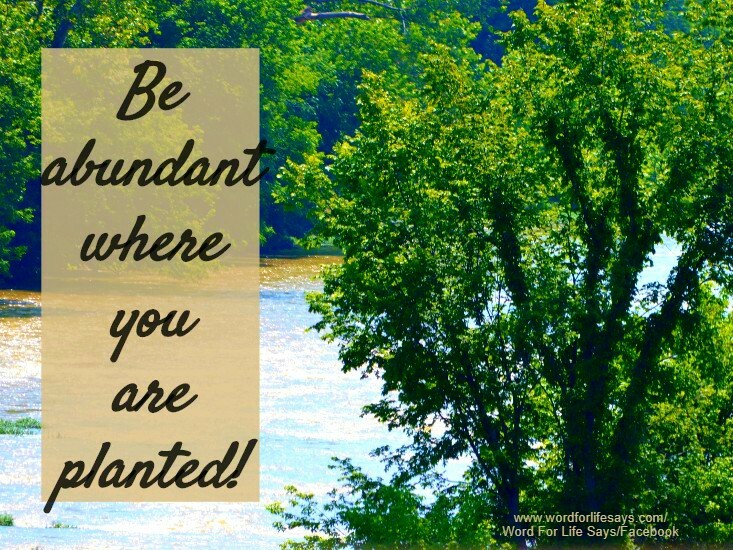 So, I declare that, “Today, right where I am planted, I will be fruitful!